On June 13th, New Jersey Governor Phil Murphy signed new gun prohibitions into law; legislation that establishes background checks on private gun sales, bars armor-piercing bullets, and reduces magazine capacity. Below, we discuss these new provisions in detail, and why there could be law enforcement concerns associated with them. Mandate that residents demonstrate a “justifiable need” in order to obtain a carry permit. Violating these new provisions can carry jail time, financial penalties, and repercussions for a lifetime, including potential interference with employment opportunities. Specifically, these new laws allow more individuals to be charged with unlawful possession or use of firearms, possession of a weapon for unlawful purposes, possession of an assault weapon, possessing illegal weapons, and possession of a weapon without a permit or license. 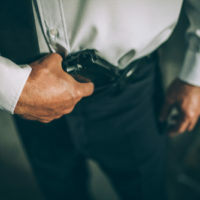 When new weapon prohibition laws are passed, one of the first concerns is that these provisions could enable police officers to charge more and more innocent individuals of these crimes, as well as potentially engage in illegal search and seizure, violating citizens’ constitutional rights. Most weapons are found as a result of the police searching an individual’s car, home, or personal effects. Recently the U.S. Supreme Court ruled that police first need to obtain a warrant before searching a vehicle in a parked driveway, which means that if they conduct a search and arrest based on finding a firearm in a vehicle parked in your driveway, the fruits of that illegal search cannot be used against you in court, and the charges must be dropped. Working with your attorney to suppress any illegally-obtained evidence and ultimately towards a dismissal of the charges. Contact our experienced criminal defense attorneys at the New York office of Phillip J. Murphy today for a free consultation to find out how we can help.